“La Petite Vigne” is ideally located in the historical center of Amboise just up the street from Leonardo Devinci’s “Clos Luce”, and walking distance to the Castle of Amboise and the renowned outdoor farmer’s market along the banks of the Loire river. 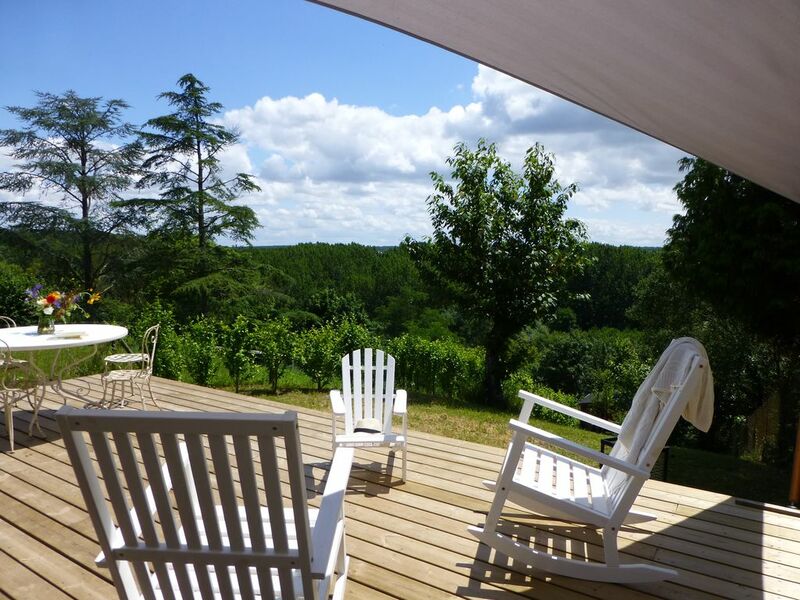 The cozy cottage offers a private, independent structure with a large 450 square meter landscaped and enclosed garden, and a large deck overlooking the forest of Amboise. The deck faces South and is perfect for relaxing in the warm sunlight, reading, painting, yoga or just enjoying the view. If you are looking for “French Countryside” in the heart of the historical village, we believe you will be very happy at “La Petite Vigne”. The wooden cottage was completely renovated in the end of 2011 and the gardens were professionally landscaped (a work in progress!) in the Spring of 2012. Amenities include modern appliances (dishwasher, oven, vetro-ceramic stovetop, refrigerator/freezer, washing machine), queen size (160cm) canopy bed, comfortable/convenient sofa-sleeper (140cm), modern bathroom with glass hydro-massage shower, LED flatscreen TV with 100+ including CNN, DVD Player (multi-zone), IPAD/IPOD speaker/dock and free internet WIFI and telephone calls to the U.S.A, Canada, and Europe. The house measures 35 square meters and is an open “loft” layout with a comfortable bar type kitchen with four stools for rainy days. It is perfect for a couple or a small family, but we remind you that there is no separate sleeping area. It is full of sunlight and modestly decorated in white and natural colors lending a feeling of space and elegance. The main attraction of the property is the large enclosed garden and 42 square meter deck that surrounds the house with a Weber gas BBQ, table for four with umbrella, rocking chairs, sail awning, and plenty of space to enjoy the fresh air and magnificent view of the valley below. Parking is available on the street in front of the house. A secured “cave” or storage area is available upon request for bikes (and wine!) on the street level. There is a narrow staircase to access the property. Therefore, we do not recommend “La Petite Vigne” for anyone who has difficulty climbing stairs. We are a Franco/American family and all communications, indications and instructions can be communicated in French, English or Italian. Send us a note if you need any additional information. We fell in love with this land and view. The cottage is full of light all day long. It's very calm and quiet all the while being on a main street leading to the Castle. This is very difficult to find in the historical center of Amboise! La Petite Vigne is quite special due to the fact that it offers a large private, enclosed garden with an outstanding view over the Amboise Forest and at the same time it is situated in the heart of the historical center just 200 meters from the Clos Luce and 500 meters to the Castle of Amboise. Parking in front of the house allows guests to easily enter/exit Amboise and tour the surrounding area and castles by car or bike. The cottage is situated on a plateau overlooking the valley with easy access to numerous bike routes connecting villages throughout the Loire Valley. We are also just 10 minutes by bike to a wonderful Equestrian center, Les Ecuries du Pray, that we highly recommend for horseback riding throughout the region. We offer FREE unlimited calls to over 100 destinations including the U.S.A and Canada! Sheets for beds and baby crib according to necessity. Generally space can be found on the street in front of the entrance. This is not a private parking space however the neighbors are generally respectful of leaving space in front of the house. Mid-size and well organized with small freezer. American coffee maker and a water boiler for tea. All guests are responsable for their own pantry items but often pantry items may be left from other previous guests. Small but very well organized for even the most elaborate meals. Opens onto living and sleeping area. Includes boiler, toaster, coffee maker. Programmable oven. Vetro-ceramic stovetop. Kitchen Island comfortably sits 4, Round Table on Deck sits up to 6. LED Flatscreen with USB Port monitor for DVD player or computer hookup. No local or cable television. Limited selection of DVD's for children and adults. 45 square meters of grass, landscaped flower gardens, enclosed with a fence. Sun Deck., Iron & Ironing Board, Extra blankets & Pillows, Electric Heating (Quick and Safe)., Backgammon, playing cards, dominos, checkers. FREE UNLIMITED INTERNET SERVICE INCLUDING FREE TELEPHONE USE TO THE U.S.A., CANADA & EUROPE, 100+ TELEVISION CHANNELS INCLUDING CNN. Just perfect! Lovely cabin! Walking distance to the main area -- chateau, markets, river, restaurants. So thrilled to have stayed. Thank you! Fantastic location, great, comfortable facilities. Everything you need to make a very comfortable stay. So much thought gone into the design and layout, it kept surprising us. Superb communication with owner. Would definitely book again. Such a beautiful chalet with everything provided for our stay. Sitting on the terrace for breakfast and in the evening with the sound of birdsong and views across the countryside was delightful. A 15 minutes walk into the centre past troglodyte homes was easy and fascinating. We had trouble operating the tv and instructions would have been helpful but the housekeeper who lived opposite was quick to come over and sort, on some evenings there was no reception at all. Other than that this was a delightful property and we enjoyed our stay very much. Thank you, Helen, for this wonderful review. We’re glad to hear that you enjoyed your stay in Amboise and the Petite Vigne and that you weren’t too inconvenienced by the TV problem. I’m still not sure what happened! In any event, we’re delighted that you could take advantage of the outdoor space and relax. Come back anytime ! Great choice for a couple to enjoy the Loire Valley! We really enjoyed our stay at Le Petite Vigne. Very convenient location for a romantic getaway in the Loire Valley. The little house had everything we needed and was very comfortable. We also really enjoyed the view. Enjoyed a couple of evenings on the deck with some great wine! Awesome place! La Petite Amboise was as advertised. It is a small attractive place that serves as an ideal retreat from the busy tourist scene of Amboise. With good weather the deck really makes the place special. The parking can be a challenge and the walk to Amboise is more than a short stroll. However I would recommend the property. Beautiful home with great views ideally situated near downtown Amboise. Street parking available and lots of good dining and site seeing info in the guest book. Very comfortable. Amboise is centrally located in the heart of the Loire Valley with easy access to the numerous castles, parks, forests and sites of the region. We highly recommend the Festival of Gardens in Chaumont (15 minutes by car) May-October, and site seeing on horseback at Les Ecuries du Pray just 10 minutes by bike. Special rates for long stays in August. Winter 3 month rates are available to teachers and students.